Do you put premium gasoline in your car? You’re probably wasting your money. A new study by AAA found that 16.5 million Americans had filled up their cars with premium gas unnecessarily in the past year. That’s $2.1 billion, completely wasted. Roughly 70 percent of Americans own cars that have no practical need for premium gas and only need regular. 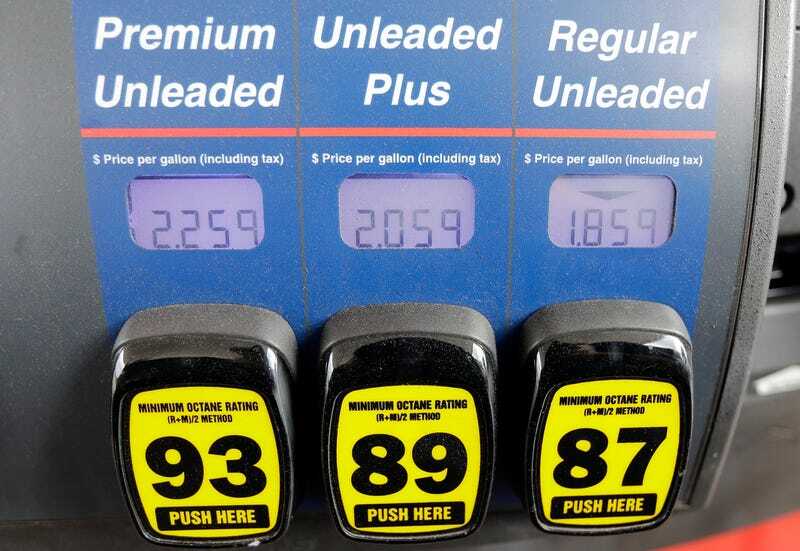 AAA conducted tests using 87-octane (regular) and 93-octane (premium) gas in those kinds of cars and found that the premium gas gave absolutely no benefits above the regular gas. Just 16 percent of Americans own a car that requires premium fuel. And if you’re in that 16 percent you probably know who you are. The remaining 14 percent? Those people need the mid-grade gasoline. At this point I’d suggest checking your car’s manual to figure out which camp you’re in. But here’s the part where car novices might really be thrown for a loop. According to AAA, there is a wide variety of quality in gas, depending on which retailer you choose. Which is to say that not all 87-octane gas is created equal. So all those “top quality” gas ads I make fun of on TV? Apparently there’s something behind that.